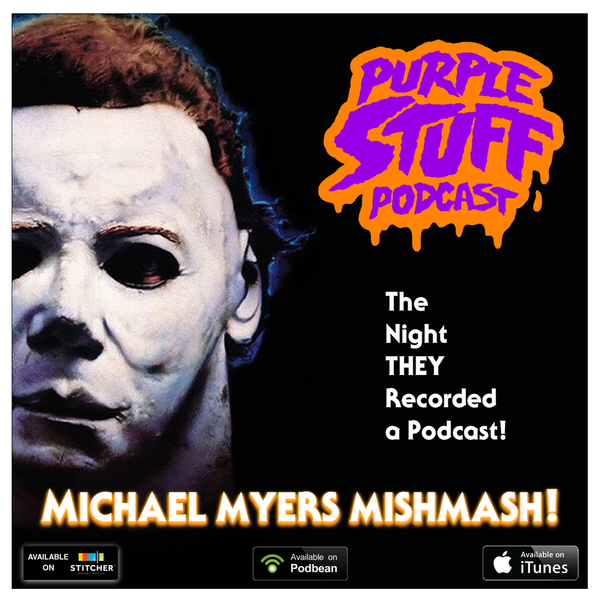 PURPLE STUFF PODCAST: MICHAEL MYERS MISHMASH! 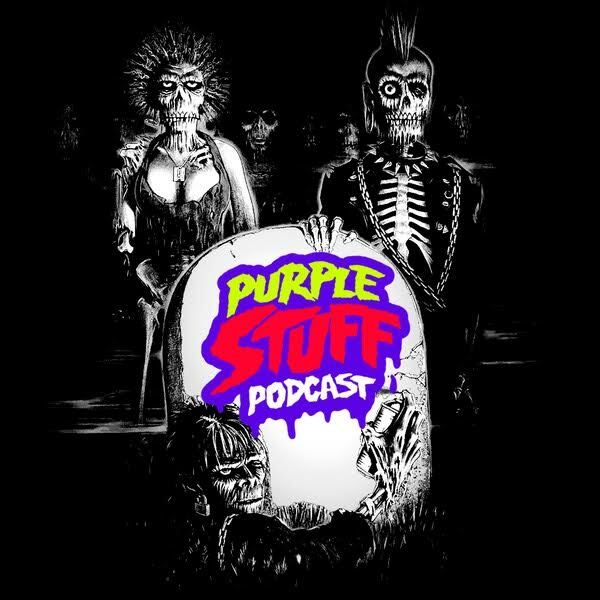 We’re back with a new Purple Stuff Podcast for your Halloween season. This episode couldn’t be more appropriate. At least from my view, the one thing I’m laser focused on this season is the new Halloween movie. It’s not every year we get to experience an event like this. Witnessing the return to form of one of the most famous horror icons of all time, Michael Myers, deserves a commemorative podcast devoted to this momentous occasion. 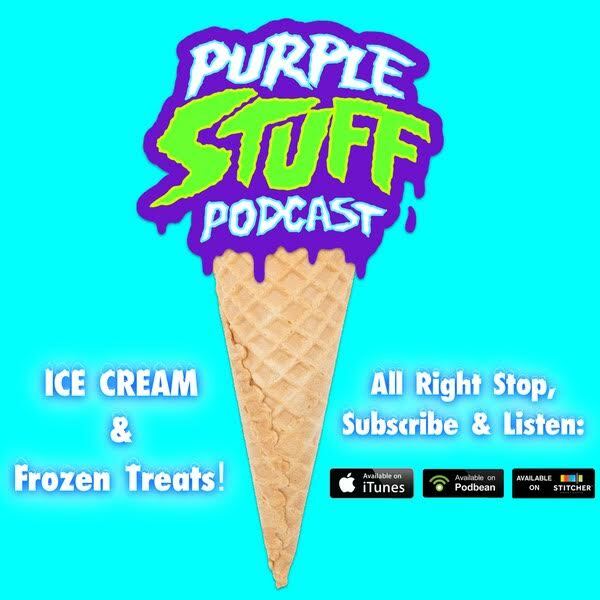 Previously on the Purple Stuff Podcast, in terms of horror, we’ve covered the franchises of Friday the 13th and Nightmare on Elm Street. We’ve been waiting for the right time to talk about the Halloween Franchise and considering that the new Halloween film hits theaters in October, now is the perfect time for this. In this episode, you’ll hear Matt and I discuss the most random Halloween stuff. You can hear deep dives into the films and commentaries on each movie anywhere, so we are bringing you the things that linger around in the “Halloween Franchise” section of our brains. Yes, we do have that section up there and now you will have direct access to hearing about it. We’ll discuss everything from the insanely disturbing mask scene from Halloween III to absolutely whacked out posters and weird decorations inspired by the films. Some of the entries aren’t even from the actual films, but wouldn’t exist without Michael Myers or the Halloween movies. If you’re a fan of the Halloween films, this show is a must listen. We’re super excited to see the new installment so hopefully our new episode will get you juiced up for the movie also. Let is inspire you to pull out your favorite installments of the franchise and maybe watch it with the commentary this time! Dig a little deeper to absorb all the weird inconsequential details that potentially change the way you think about certain aspects of these films. That’s certainly something I do often since I’ve seen these films hundreds of times throughout my life. Most horror films I grew up watching would be rentals and it always felt like such a big event to take one home, regardless of the fact that I saw them all already. That’s one of the most fun things about this time of year. You can re-experience things you’ve seen or heard a thousand times, but they still feel new, yet nostalgic at the same time. If you have any memories or favorite aspects of the Halloween franchise that you would like to share here, please leave a comment below! Thanks for reading and listening. You can hear this one on iTunes, Podbean, and Stitcher. Sharing the show on social media is the best way to help support the show. 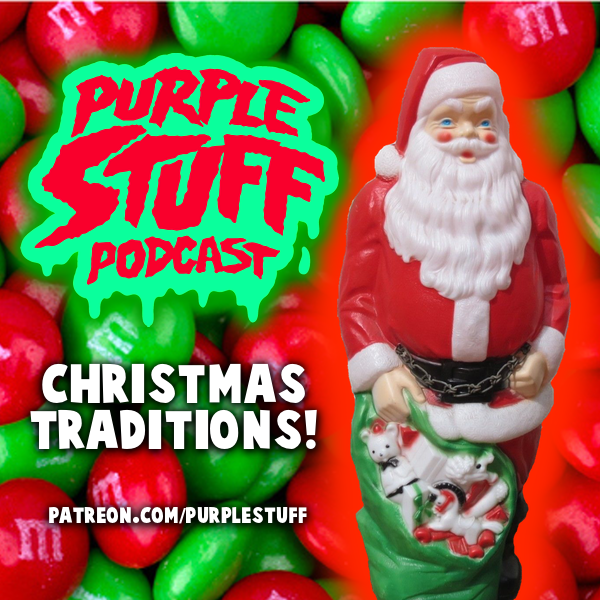 Tell your like minded friends about The Purple Stuff Podcast so they can join in on all the nonsense with us as well! 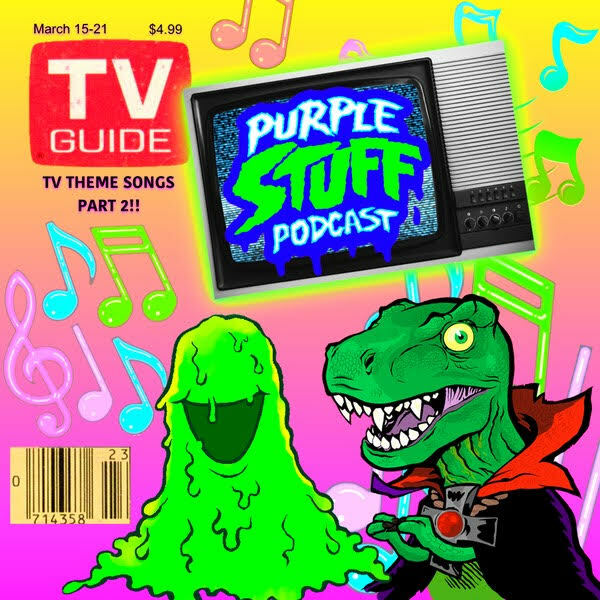 Purple Stuff Podcast: Spooky Songs 2018! I’d be lying if I said The Purple Stuff Podcast has been on an exotic summer vacation. Truth is, we’ve been simply gearing up for the BIG season, you know, the only season that matters! That’s right, believe it or not, Halloween time is here and I’ve got shivers up and down my spine at the mere thought of it all. Haunted attractions, pumpkin spice everything (yes I am a fan), horror movies on loop, hoodies, and of course, the soundtrack to it all: SPOOKY SONGS! Dino Drac and I have teamed up once again to bring you a collection of tunes that you can slide right into your Fall and Halloween playlists. This episode is available right now from iTunes, Stitcher, and Podbean etc. Check it out and subscribe to the show if you haven’t already. You’ll hear some absolute treasures in this episode that you may not have known even existed. There’s a metal injected TV theme song, a satirical sequel to a classic, and even a track based off an old toy line. In the end, they’re all excellent choices to incorporate into your Halloween playlist this year. We had a blast with this episode so we hope you will to! If you have any spooky musical suggestions for us, leave them below in the comments! Thanks for reading and listening! Pursuit of maintaining childlike wonder requires excitement, even for the simplest things. Submitted for your approval: ICE CREAM. 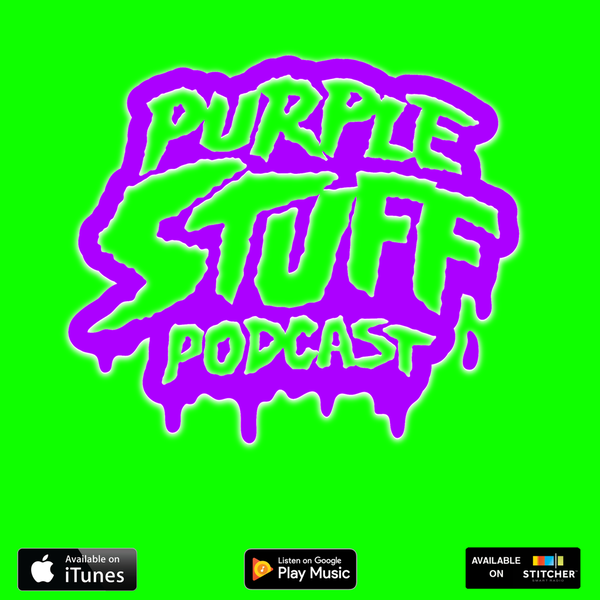 The newest episode of The Purple Stuff Podcast is a big one. It’s all about some of the most outstanding ice cream and frozen treats. You need not be an expert on every single offering in your grocer’s freezer or every single Good Humor variation displayed on the side of your neighborhood ice cream truck to enjoy this one. Once you start thinking about your favorite frozen treats from throughout your life, the floodgates open. This is what happened to Matt and I in this episode. There were so many great ones that we had to try to squeeze them all in! There’s a brain freezing treat awaiting everyone who listens to this one. Maybe you dig Italian ices? Maybe you are a soft serve type of person? Or you may be a fan of one of the more obscure ice pops that was only sold in one section of the world in 1991? No matter what, it’s pretty safe to say that everyone has a special spot for some kind of frozen treat so this one celebrates that. Memories of hot summer days chasing down the ice cream truck will rush back into your mind. Remember when you would eat a colored ice cream pop and your mouth, lips, and tongue all turned that color? Fortunate for us, the summer is almost here so we are celebrating that feeling by digging deep into our memories and telling you all about a slew of our ultimate Ice Cream entries. In this episode we will touch on everything from shark pops to alien cakes to great balls of ice cream. It’s a creamy and delicious audio compendium of our favorite frozen treats. Please subscribe on iTunes, Stitcher, Google Play Music or Podbean, OR you can check it out at the link above!